The Seludo Story Project – writing a family memoir – marks our journey to document, understand and emotionally heal from a series of tragic events that drastically affected our family. It began on September 13, 1989 when our 46 year old father, Dr. Manolito T. Seludo, took one sip of water and his life fell apart. The drinking water in his duplex townhouse in Napoleonville, LA was laced with a highly toxic and fatal chemical, potassium cyanide. Someone tried to kill him. He faced death but was revived in the ambulance and remained lifeless while in a coma at the hospital. He went from seeing patients to being a patient for the rest of his life. He lived in misery and discomfort, bed-ridden and unable to walk and talk. Our father was poisoned, our lives were shattered. In August of 1991, two years after our father’s poisoning, our 49 year old mother was in a near-fatal car accident while driving on a narrow two-way road in the bayou town of Raceland, LA. She was struck by a drunk driver in a head-on collision leaving her sandwiched in the car. Realizing that every wasted second could compromise her life, the emergency response team used the “jaws of life” to pry the vehicle open to remove her trapped body from car. With her life threatening injuries, she was transported to the nearest hospital by helicopter. She survived the accident but she was never the same. We were 15 and 13 years old when our father was poisoned. We were just beginning to enjoy our adolescent years but were forced to make an overnight transition from teenage life to adulthood. We found ourselves faced with overwhelming responsibilities of assuring that our parents get through rehabilitation, surgeries, making medical decisions and multiple medical appointments while trying to remain in school. With two hospitalized parents and not understanding what it meant to have financial obligations, our cars and home were eventually taken from us. In 1991, at 17 and 15, we were forced to separate just to find a place to live. Totally unprepared, we were left alone to figure out this thing called “life”. It is now 22 years later since our father was poisoned. As teenagers, we were only capable of reacting instead of comprehending what happened to us and our parents. As adults, we want to understand and process what happened and we are prepared to peel back the layers of our lives as we explore our parents’ medical and legal records and talk with people who knew our parents. For purposes of self-healing and keeping our parents’ legacy alive for our future generations, we are finally ready to chronicle “The Seludo Story” from the eyes of the “Seludo Girls”. * We invite you to stay informed by subscribing to our blog and engage with us by leaving comments to our posts or posting on our Guest Book with a memory you shared with our family. Alfie’s Entry: Rummaging through a box of old photos, I found this pic of Dad taken April 1989, just 5 months before he was poisoned on September 13, 1989. This picture was taken on a Saturday at his townhouse in Napoleonville, LA. We spent the weekend at Dad’s place. (Side note: Our dad had his own place in Napoleonville because he was in the process of establishing his new practice in Napoleonville after practicing in Larose for nearly 10 years). Sporting his brand new apple red Audi 90 Sport, we cruised to the hospital with him so he can make his rounds for the day. Dad was always proud of his new toys. After waiting for him to do his rounds at the hospital, he wanted us to take pics next to the car. 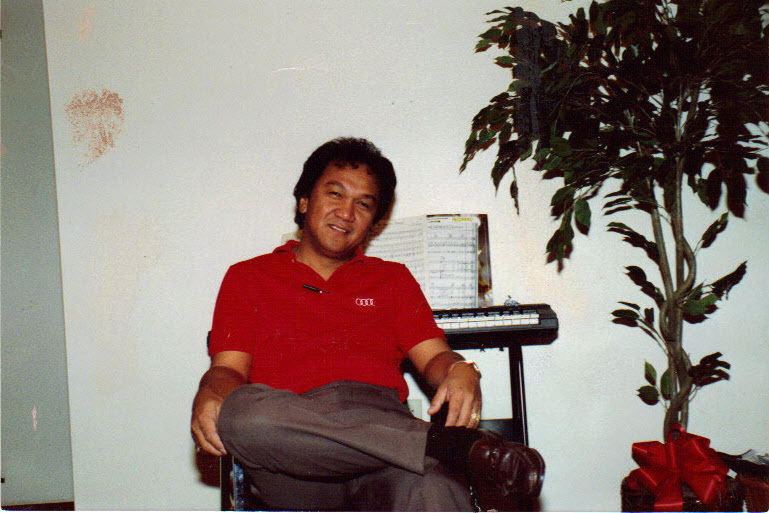 We were eager to get back to his townhouse so that we could pull out our singing machine and his keyboard (in the background of this pic) and spend an afternoon with our dad singing and playing the keyboard. I really believe that outside his passion for being a doctor and his family, the next important thing in his life was music. I’ll post a video of him singing his favorite song, My Way, in the near future.